Have the festive table of your dreams and let it be heart-healthy too! Home » Lifestyle » Have the festive table of your dreams and let it be heart-healthy too! Finding small ways to make your diet healthier will leave you some room to indulge in the treats the festive season has to offer as well, and Flora can show you how. It can be very difficult to say ‘no’ to all the treats of the festive season when you’re trying to watch what you’re eating, with many a healthy eating plan falling by the wayside during this time of the year. But how do you get your table laden with delicious food that is not just appealing, but also heart-healthy? The key lies in balancing your plant-based foods with other meals and finding ways to make them healthier without losing the taste. To this end, Flora hosted a Festive Masterclass and Pick n Pay Good Food Studio where some lucky guests got the chance to taste scrumptious festive recipes while learning more about making smart choices for a healthy festive season. All of the dishes were made with Flora, which, in turn, is made from 100% plant-based oils like sunflower, canola and linseed oil. These oils support a heart-healthy lifestyle while adding flavour to your dishes. The vitamins and minerals contained in Flora are also absorbed into the body and assist in maintaining heart health. Flora is so much more than just a tasty spread; it can also be used as a cooking aid and ingredient, just as the special event host, Zintle Ntshikila showed by preparing the dishes everyone indulged in. Says Zintle: “As someone who has been on an extensive wellness journey, having lost a lot of weight and made big changes to my eating habits, I find Flora to be a great addition to my cooking”. The dietician Roseanne Lombard also reinforced the importance of plant-based eating and the merits of margarine as a plant-based spread with heart health benefits. Using a vegetable peeler peel the courgettes lengthwise to form thin ribbons. Place the strips on a tray and brush with the melted Flora Regular. 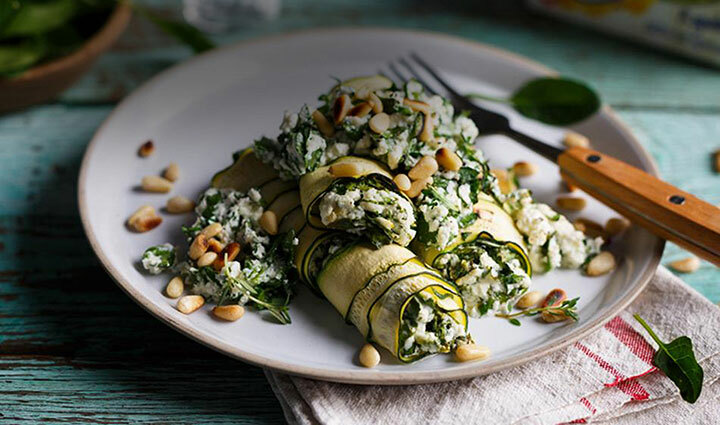 Create a sheet by layering the courgette ribbons slightly onto one another and drop about 3 - 4 teaspoons of filling on one side of the sheet and roll the courgette layers over to form cannelloni. Repeat until most of the cheese filling has been used up; leave enough to crumble over the top. Arrange the cannelloni in an oiled casserole dish, packing them tightly. Sprinkle over any remaining filling, season well then bake at 180°C for 10 -15 minutes or until golden. Serve garnished with pine nut.